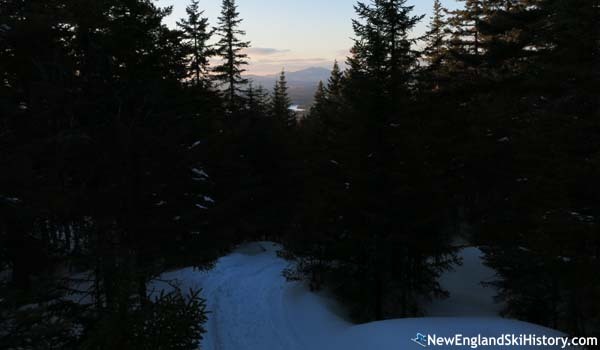 Located just outside of the village of Oquossoc in Rangeley, 2,470 foot Bald Mountain was briefly home to a ski area before being overshadowed by nearby Saddleback. 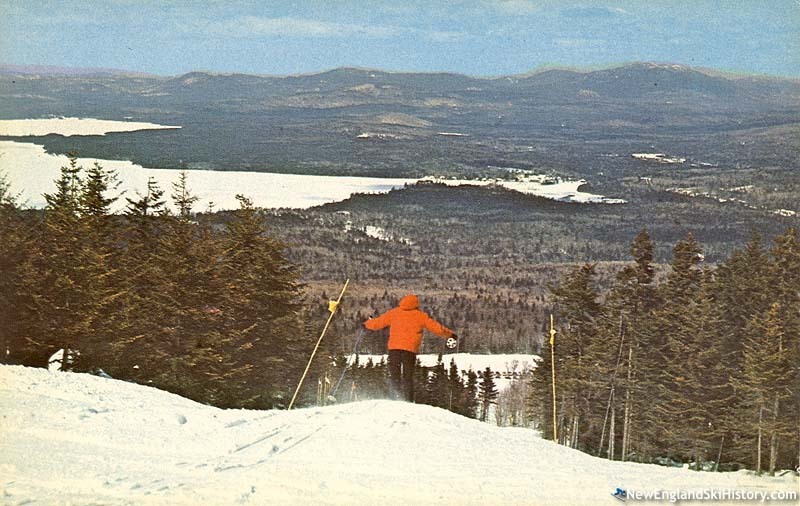 Ski resort fever hit the Rangeley Lakes region in the 1950s when local businessmen looked to tap into the growing number of skiers in New England. 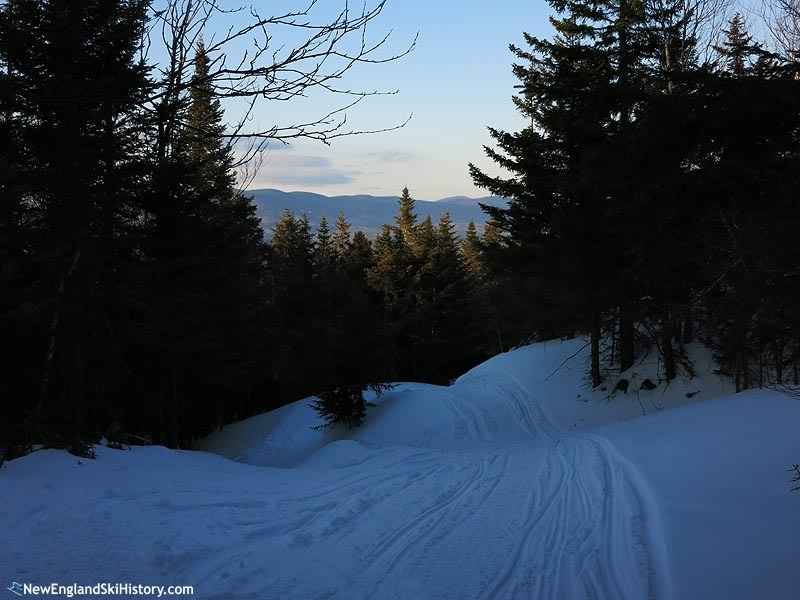 Ski area designer Sel Hannah was brought over from New Hampshire to check out 2,470 foot Bald Mountain in Oquossoc and 4,116 foot Saddleback Mountain near Rangeley. While Hannah saw more potential in Saddleback, both mountains were developed by separate companies. By spring of 1958, Bald Mountain had already been surveyed and plans for a chairlift were being considered. The Bald Mountain Ski Corp., led by local developer and State Senator Shelton C. Noyes, pulled together $24,300 from area business owners and commenced work on December 4, 1959 on land leased from International Paper Company. In 45 days time, an access road and 400 car parking lot were built, a train station dragged in for a lodge, a trail cut, and an 800 foot rope tow constructed. Bald Mountain ski area opened at the end of January of 1960 with Governor John H. Reed arriving via dogsled. Future expansion plans were quickly touted. While plans were made to install a double chairlift for the second season (for both skiing and summer sightseeing purposes), they were eventually scaled back to a 2,300 foot T-Bar. Nevertheless, the new lift provided a significantly expanded vertical drop of 500 feet (occasionally referred to as 1,200 feet) for the area, sometimes advertised as Rangeley Bald Mountain. Popular trails included the Mooselook Warbler and the Rangeley Spinner. Night skiing was introduced, as was ice skating and a larger parking lot. Unfortunately for Bald Mountain, its improvements were overshadowed by opening of nearby Saddleback. Growth continued leading into the 1961-62 season, as two new trails were cut. Big plans were discussed in late 1962, including the possibility of installing a gondola for year round use. Unfortunately the ski area's growth was going to slow dramatically as neighbor Saddleback installed a double chairlift that served over twice the vertical drop of Bald Mountain in 1963. Two ski jumps, 12 and 25 meters, were added for the 1964-65 season. 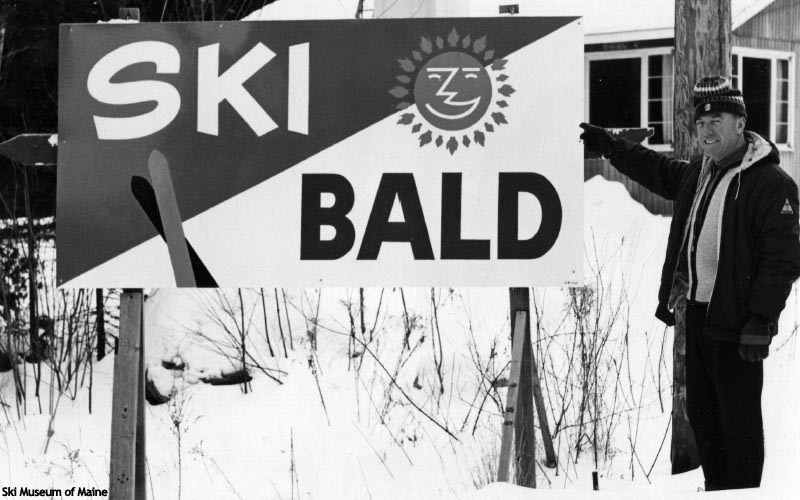 Saddleback and Bald Mountain worked together to put on a winter carnival during the 1965-66 season, including skiing, skating, dogsledding, and ice boat racing. Bald Mountain likely shut down following 1967 or 1968. By the time 1969 rolled around, the area was delisted from guidebooks and likely liquated. The T-Bar was likely installed at Titcomb in 1969. The base area has since become home to the Rangeley Sporting Clays and Trap Range. In 1999, a new summit observation tower was constructed above the ski area, providing hikers wide views of the region, including neighboring Mooselookmeguntic and Rangeley lakes. "I grew up in Oquossoc and skied Bald Mountain from the beginning. Tibby gave us first aid lessons and we became a junior ski patrol and skied free. We would also sit in the shack at the top of the lift to watch for problems. They also had night skiing to about 1/2 way up. After the lifts closed, I would ski home through the woods." "That picture of the handsome skier holding the bald mt. sign is Gautier Able Thibodeau otherwise known as Tibby or as i called him grampy. Thank you for the picture!"